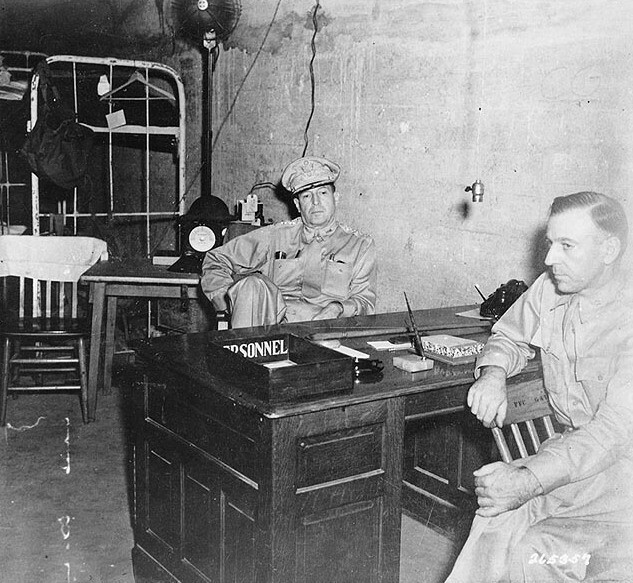 Following President Roosevelt’s orders, General Douglas MacArthur left the island of Corregidor in the Philippines on 12 March 1942. He was bound for Australia to assume command of Allied forces in the Pacific. His phrase “I shall return!” subsequently became immortal. MacArthur left Corregidor with his wife, son, and personal and military staff on board four motor torpedo boats that headed south for the island of Mindanao, also in the Philippines. There, MacArthur’s party boarded B-17s and flew to Australia. He first uttered his famous “I shall return [to the Philippines]!” phrase as part of a speech he made about ten days later while changing trains in the small South Australian town of Terowie. He used the phrase again in later speeches. On 20 October 1944, MacArthur returned to the Philippines at the head of a massive invading army. This entry was posted in World War II and tagged Corregidor, I shall return, MacArthur, Philippines, Terowie. Bookmark the permalink.